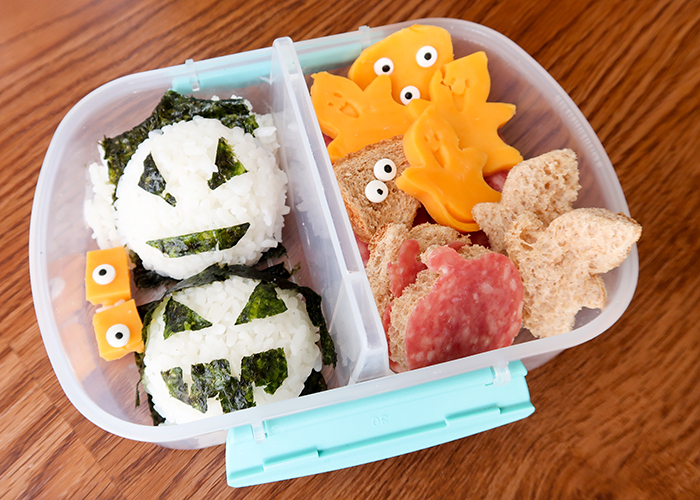 I’m so excited to share this Halloween Bento Box Lunch with you! 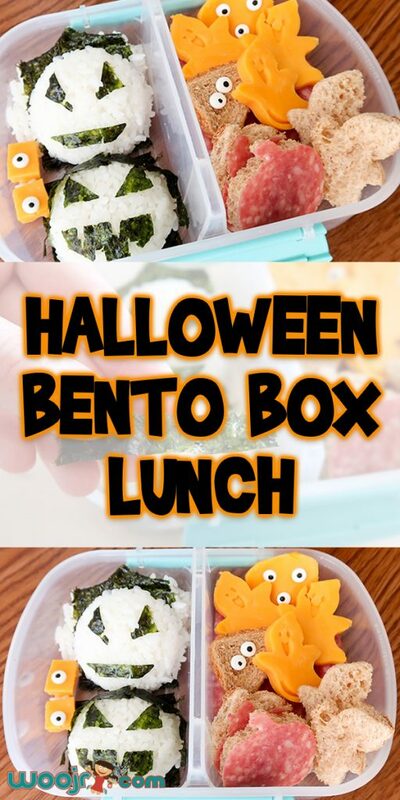 It’s an easy way to make a Halloween bento box, and you can use the techniques on a variety of foods to customize it to your tastes! Here’s what I used to make this bento box. 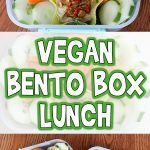 It’s very hard to find bento supplies in stores in the United States, unless you live near a major metropolitan area. So I often use candy and cookie making supplies, as well as a sharp knife, to create my bento designs. Pumpkin and Ghost cookie cutters/presses. I found these at Michael’s for .99 cents. 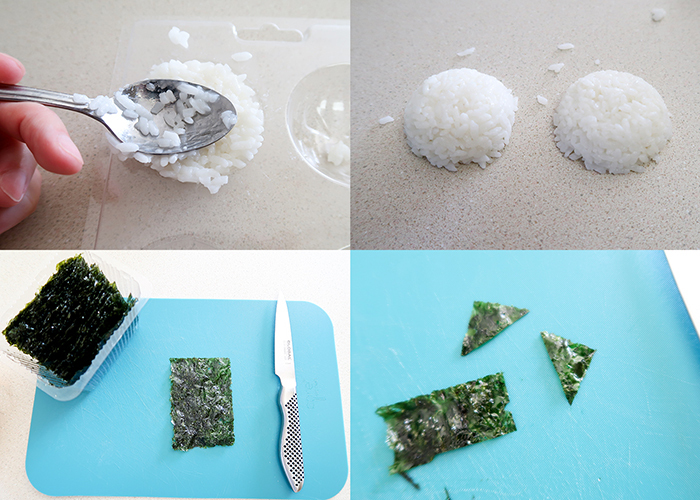 Seaweed (Nori). I use the roasted seaweed snacks at Target, but you can also get whole sheets in the Asian section of most grocery stores or your local Asian market. 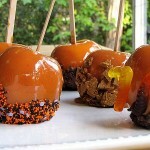 Let’s start by making our rice jack o lanterns! 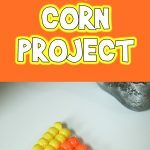 Take your cooked rice and pack it into your candy mold with the back of a spoon. Your rice should be sticky, but if it’s a bit dry, just add water and heat it up a bit to make it sticky enough to hold together. 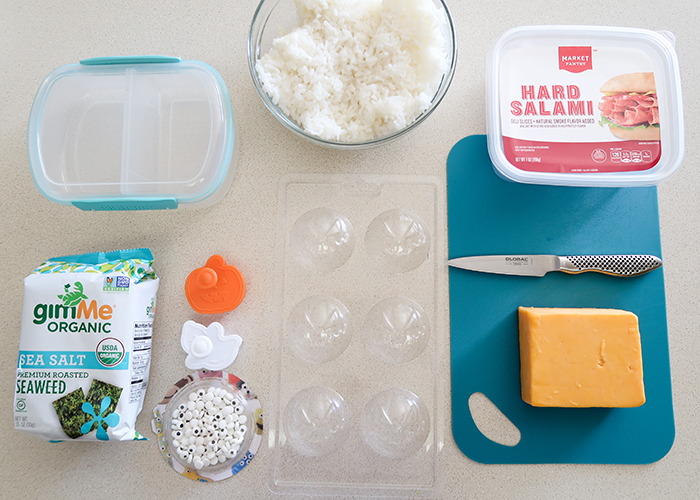 Turn your mold over and tap it on your counter, and your rice should pop right out. Obviously the faces aren’t visible, so let’s fix that! 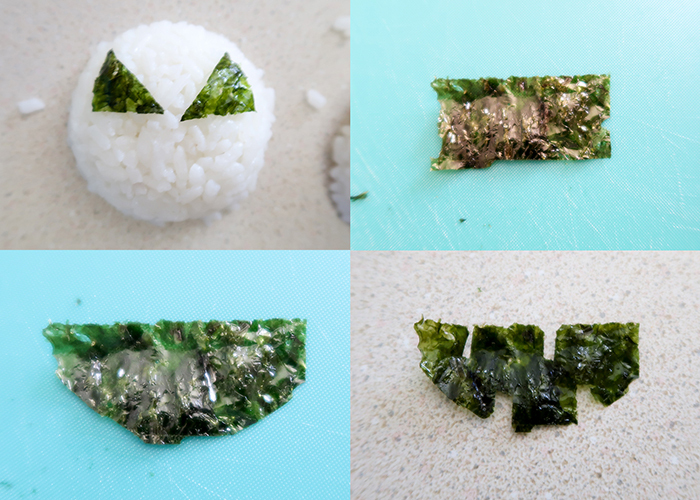 Take a piece of your seaweed and cut out two triangle eyes. Place them right on your rice. Then cut a rectangle, curve the bottom edges, and cut out teeth spaces to make a smile. 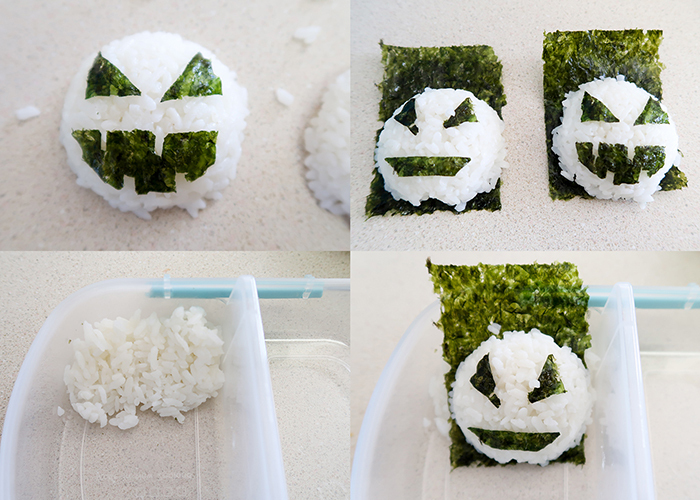 Press this onto your rice as well, and you have a rice jack o lantern! Now just make another one. I laid both of them on sheets of seaweed. In my bento box, I pressed a bit of rice to create a base for my jack o lantern to lean against, and then set it in the box. I just laid the next one flat down. You can also lay these on a bed of salad greens or other grains. Now take your cheese, and make some medium thick slices. 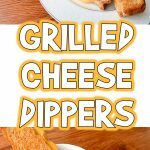 You can use a variety of cheese and colors as well. 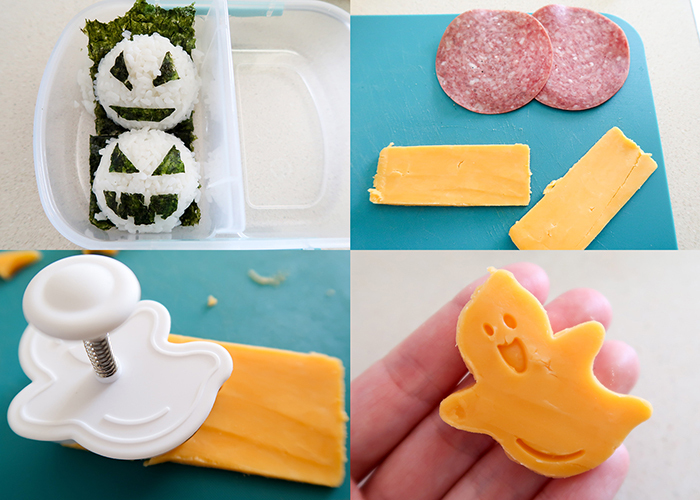 I took these little cookie cutters/presses, and use them to cut out the cheese into ghost shapes as well as press a face onto them! 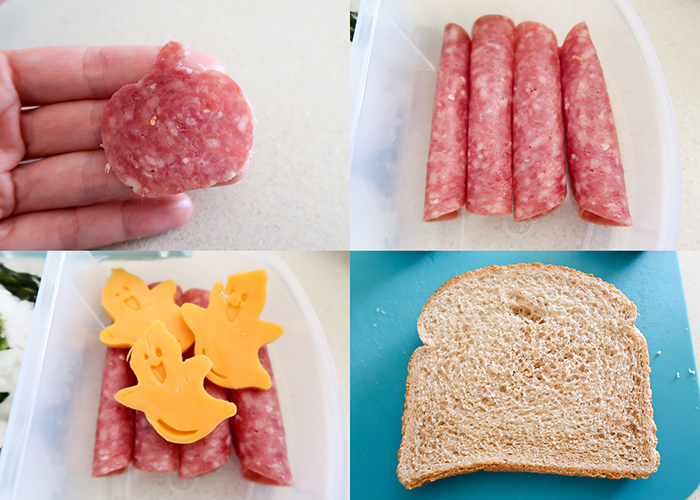 I also used the pumpkin shaped ones to make pumpkin shaped deli meat! For this section, I laid down a base of rolled up salami slices. Then I topped it with the cheese ghosts. I then grabbed a piece of bread. And cut it into shapes as well! I layered the bread and meat slices in the other end of this side of the box. Then I wanted to make a couple monsters. 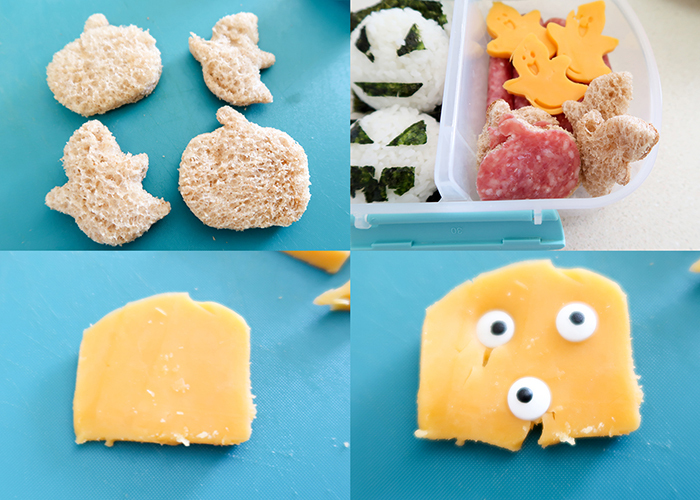 I just cut a random shape of cheese, and pressed some candy eyeballs into it! I just kept adding a couple extra details, like a bread monster and a couple free floating eyes in pieces of cheese. I also added some extra seaweed hair to one of the jack o lanterns. And you’re all done! 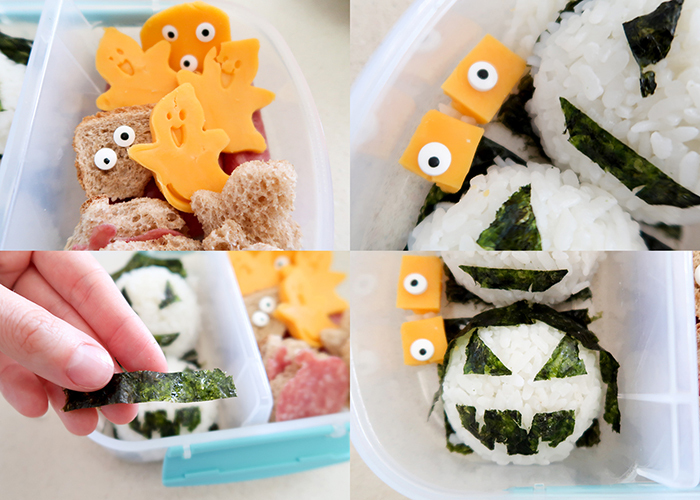 The most fun thing about making a Halloween Bento Box Lunch is that the only limit is your imagination! 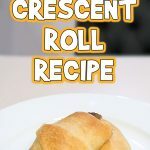 You can use traditional ingredients like rice and seaweed, or more kid friendly ingredients like cheese and bread. It’s all up to you! 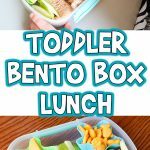 I hope you have fun making a Halloween bento box lunch for your little one (or yourself)!